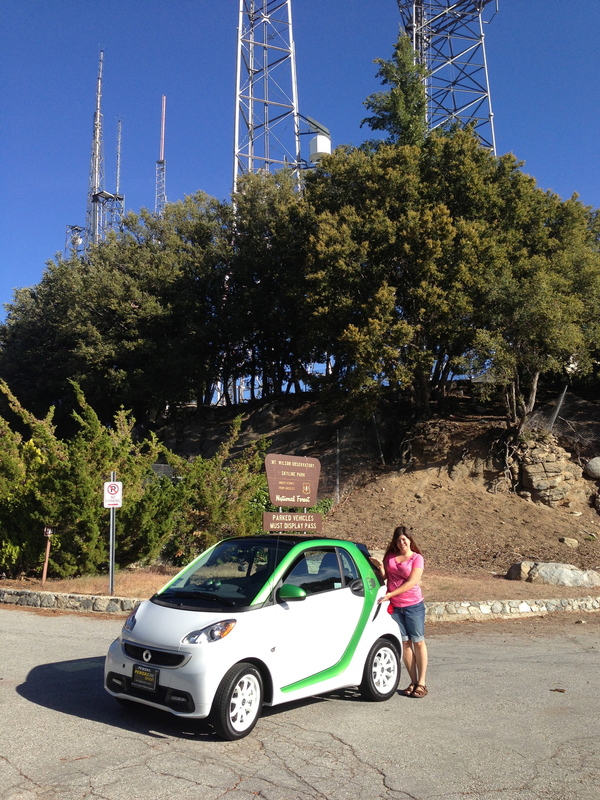 Electric Smart Car in California — Always Packed for Adventure! On Friday night, Dan and I took posession of the first Electric Drive Smart Car sold/leased from the Smart Center in West Covina. 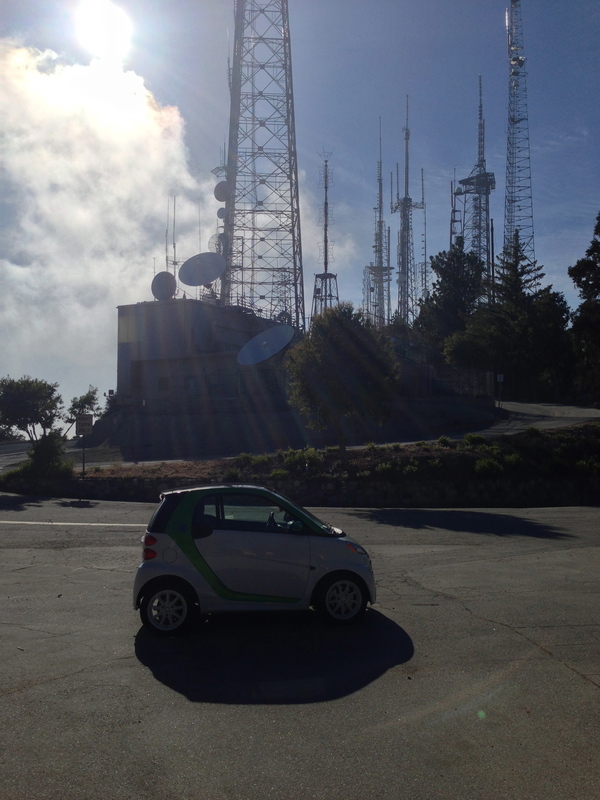 Although it hasn't been confirmed, it may have been the first Electric Drive Smart off the lot in all of California. We signed up for a three year lease on both the car and the battery through Kamaal Petersen in West Covina. Prior to deciding to go for the electric, we owned two Smart Passion convertibles. We are very active members in a local Smart Car club (So Cal Smarties) and through our club, attended a electric test drive event in Santa Monica. Dan fell in love with the electric and since his work commute is only twenty-five miles a day, it seemed like a perfect fit. He traded in his Smart Passion for the Electric. We were wowed by the great rebates and incentives to go electric and although it still cost a lot to make the switch, we felt it was worth it be among the first to experience the car. Members of our Smart Car group highly recommended both the West Covina Smart Center, specifically Kamaal and it swayed us to give the dealership our business. Although it was a long wait and we spent many hours at the dealership, our transaction was wonderful. There were legal issues regarding the contracts on the electrics specific to them being sold in California and it created a delay in the cars being available for sale. Since we were the first, it slowed down the process of signing the lease documents. However, Kamaal kept us in the loop and when it was all finished, we were very happy with both the dealership and his service. Here is our new Electric Drive Smart car. We have named her Grasshopper or Hopper for short. Unfortunately, we made the tough decision to sell of Dan's RTR, Thunder, when we decided to go electric. Thunder, although beautiful, was a major gas guzzler and an all around expensive toy. It was very sad to see her go, however we hope that she has found a new home and hopefully someone who will take her out on a race track where she belongs. Lots of great memories in Thunder, especially our mega road trip in Utah. One of the major negatives that we keep hearing regarding the ED Smart is lack of range. When driven sensibly, it can go up to ninety-one miles on a charge. Naturally, we like to push the limits, so on our first day of having Hopper, we took her from Glendale to the top of Mount Wilson in the Angeles National Forest. The drive was approximately sixty-five miles round trip and half of it is a hard climb. We mounted a GoPro to the interior of the car, so that you can see the dials during the drive. The video is nearly an hour and a half, but the camera battery died before we could finish our run. We started with a full charge and returned with slightly over forty percent left. Admittedly, we were worried when we were just over thirty-five percent when we reached the top of Mt. Wilson, however we charged on the way down and ended overall gaining a charge! We really didn't know what to expect with this run, but we were very pleased with the results. Here is our GoPro video. 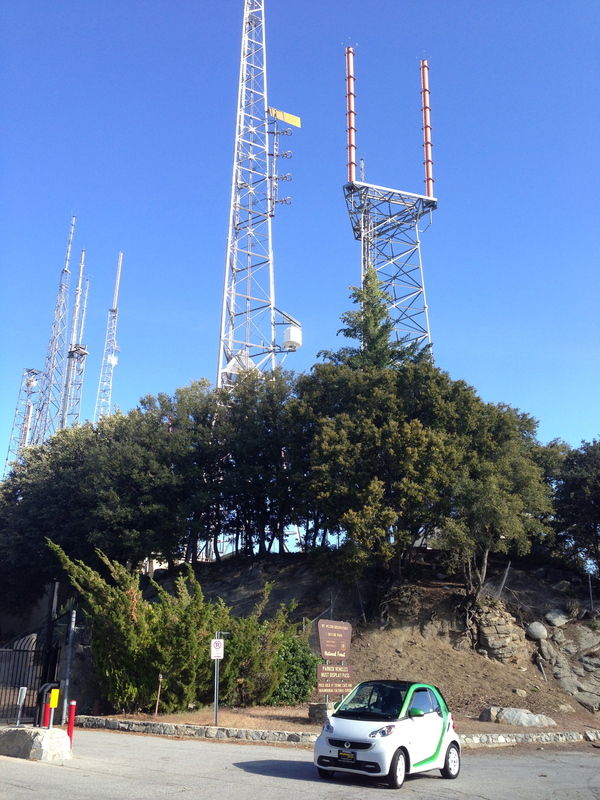 We also took a few pictures at the top of Mt. Wilson. Not bad for Hopper's first day out of the dealership. Coming Soon, our experiences with the local EV charging stations. We have some gripes!